EDITED by David: this thread looks useful to me, so I took the liberty of changing the title and making it a sticky so you can report other items in need of some love. Man, it took me forEVER at low level to save up 10k so I could complete that quest and keep the orb. Granted, I've since grown out of it, so it doesn't matter much to me anymore, but I'm sure another up-and-coming mage might want to save up for it. If it gets outshined by normal loot drops, it won't be worth it. The stats are the same as before the recent patch, but I assume you probably want to hit it with at least a health buff to stay in line with the rest. Last edited by Rylocke on Mon Jan 22, 2018 2:03 am, edited 1 time in total. I agree with that. It is supposed to be even greater than Greater Orbs, not to mention that the Greater Black Orb and Greater Red Orb are NOT available in the game as casual drops yet. David, if you read this another thing that I really feel is wrong that some very good and useful items, as greater orbs and the rings protecting form cold and death, are totally random while a player should get at least a 100% drop by defeating the gorilla king or the ancient yeti. I entirely forgot about updating the orb. It'll come in next update. Agreed about major orbs as well, they're supposed to be obtainable, yet my level 19 wand mage just found the white one. Another thing David: at very HIGH levels, I feel the need to save space in the inventory even with the bag of holding. That because Exiled Kingdoms rules make useless being warded a little bit vs. anything. In other words it is not useful to have a low level of protection from every element, while it is highly rewarding to specialize vs. specific elements one per time to have a good reduction. Therefore, rings like Ilmaran Ring, Ivory Ring and Ring of the Frozen Heart are not really useful in comparison to Greater rings that protect from 1 element only: the difference in the total score is very high. As well, the rings for wizards that give protection 20 vs 1 element + 10 mana are nice but lesser than Greater rings. What about adding some UNIQUE item that gather the effects of two and that may be found nearly at the end of the game only? * Ring of Fire and Ice: +30 vs fire and ice, Endurance +1, Wisdom 2. Merges Greater Ring of Fire, Greater Ring of Ice, Ring of Oasis. * Ring of the Enduring Stormseeker: +30 vs. acid; +30 vs Electricity, +1 Awareness, Wisdom 2, Merges Greater Ring of Endurance, Ring of Isolation and takes something from the Abboth's Ring. Liches attack with death+fire, in Irazaur tomb you get attacked with death, poison, and frost, in ark you need to protect yourself from fire and shocks. Items with multiple resistances have their uses. Also note, that many of those rings are available early, and/or have other useful bonuses . Having almighty rings might ruin the balance. Useful thread, so I renamed and stickied. Will go through everything reported here before next update. Lich attacks are pretty rare and not all of them do mixed damage. But, even if, it is not something ordinary and my aim is not to propose items that protect you from everything at once, rather to offer some opportunity to slim down the items that you keep in the vaults when you have to face specific dungeons. Of course items that protect you from 2 elements would be nice but ONLY If the bonus they provide is good enough. Usually rings provide the best defense vs. elements making most of the difference, so it is much better to have a +70 vs. death using Greater Ring of Death and Ring of Unlife instead than having a +60 vs. death and +20 vs fire replacing the Ring of Unlife with Ilmaran Ring. As well, if I use - let's say - 2 rings of Frozen Hearth I have a 18x2 reduction vs. cold and acid, for a total of 36 that is much worst than a total of 60 provided by 2 Greater Rings of Ice OR endurance (acid). Yes, the Ivory ring is a bit better due to the armor bonus and because undeads usually deal death or cold damage, but the Detection II bonus is irrelevant and overall it won't make any difference, while it is better to have a much higher Death protection since cold damage will be minimal in any case. I personally would prefer to have those rings as Unique items achieved by killing an ancient wivern or gorilla king that provide a +30 bonus vs. 2 elements at once rather than having many of them that are less effective than specialist rings. Last but not least, I did NOT ask for any almighty ring, because I know that they might ruin the balance, but just end-game unique items to narrow down the list of gear that I may want to keep and with a combo of elements that are hardly found in the same place. For a mere 1-2 additional damage, we're going from Arcane 0 to Arcane 3. 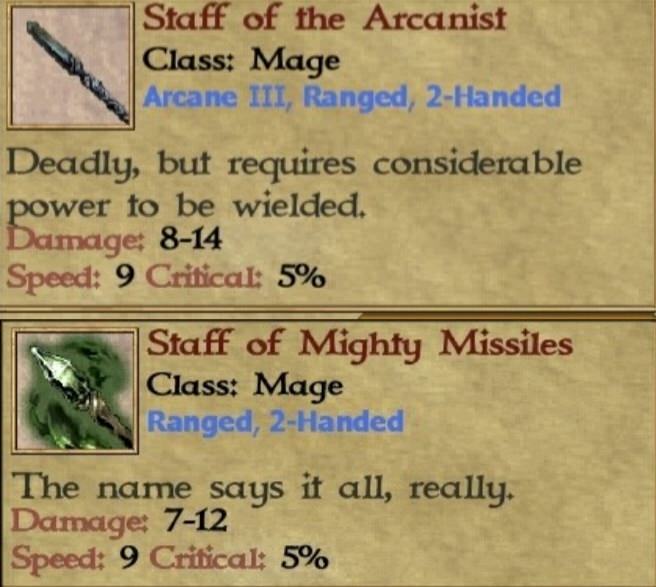 Maybe considering the gold price and mana cost, the Arcanist staff should have some more damage or additional effects.